I’m a Designer, researcher and academic based in Mexico City. My work focuses on using critical and speculative design as a way to find better relationships between design, technology and society in Mexico. I run a Design studio and I’m a full time professor at the Monterrey Institute of Technology in the Mexico City Region. How did the idea of Robokumbia come about? Originally as a Joke. 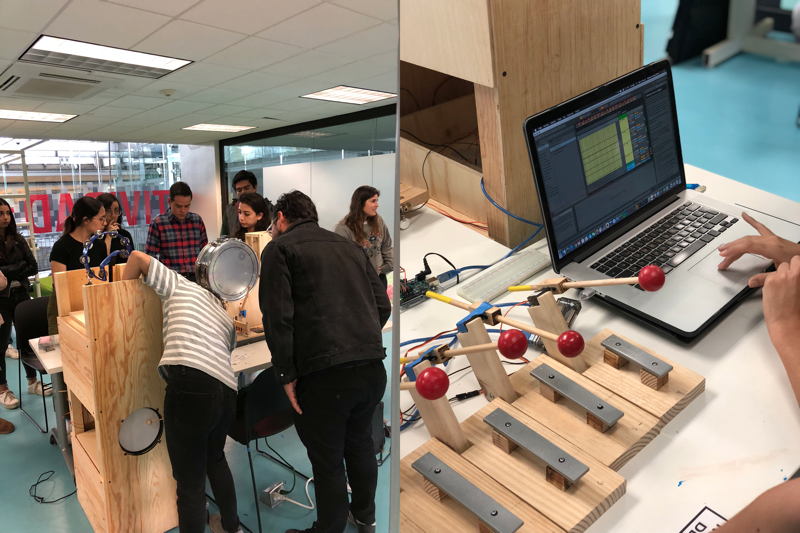 When the Regional Dean asked me what academic project I wanted to develop for the next semester, I said straight away: A Cumbia Playing Robot! Cumbia is a type of music and dance that originated in Colombia and has since then spread all over Latin America. It’s very popular among low income social sectors and could be considered vulgar among highbrow rich people. Personally it’s one of my favorite types of music. Anyway, I was trying to be funny with the Dean - I mean, how ridiculous - a Cumbia Playing Robot? Right after I answered him, he looked at me straight in the eye and said, “OK. Do it”. So I was like, "Whoa! Now I have to deliver!" Then, I started to ask myself what the academic justification for a Cumbia Playing Robot could be and it made perfect sense. On one hand, it would be a super fun incentive for Industrial Design students to generate and use technology, and on the other hand, it would be really interesting to speculate on how technology would look like if it was conceived in México, far away from the clichés of anodized aluminum, glass and white shiny plastic. 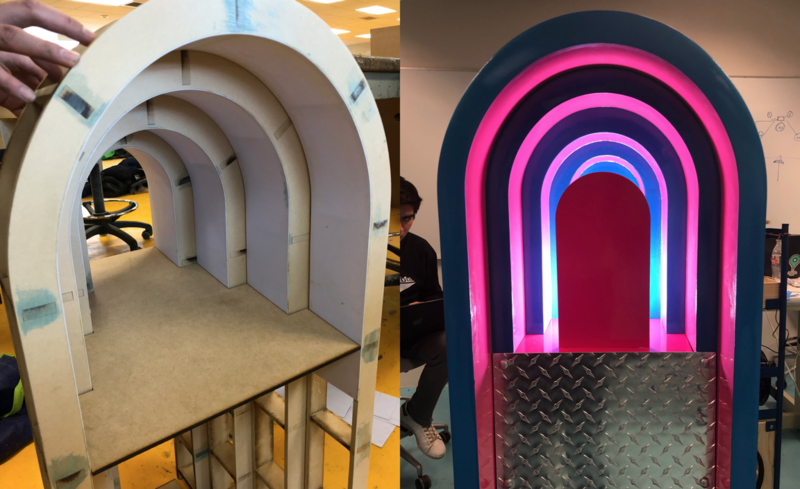 A key element of the project was to teach the students on how to find inspiration on their own context and transform those elements into proper design artifacts. If Lance Whyman found the inspiration for the identity for the Mexico City Olympics by visiting the Anthropology Museum in Mexico City one afternoon, or the Pritziker Prize-winning architect Luis Barragan found his inspiration in old Colonial houses around his native Jalisco, what could my students - as contemporary designers - create if they found inspiration in their own surroundings? So, each robot takes its inspiration from different and local sources: public transport, street markets, religious niches, and icons found in the public space and local fairs. How long was the development period? We spent one whole semester developing it. Were there any hurdles that you or the students ran into during your development? If so, what were they, and how did you get around them? Yes! I would be lying if I said that this project was not a challenge for my students and I. The synchronization between robots was an issue for us, as an example. In that case, we managed to simplify all the MIDI signals on a single master Ableton file, and that helped a lot. Another issue was the hardware. Most of the students didn’t have much experience with physical computing or with various kinds of construction, such as soldering. It was a challenge for them to find methodologies and shortcuts, to find mistakes, fix errors and to work with greater ease and efficiency as they went along. How was Max for Live used? Since I programmed the song on Ableton Live, we used Max for Live as a communication device between all the Midi signals, all of the Arduinos, and the collection of servo motors that were actually playing the instruments. The result is amazing. Now that the project is complete, what are some further areas you and the student would like to explore? I’m very interested in thinking about how to re-interpret technological interfaces in my own aesthetic and cultural context. One of the ideas that I want to work with my students next is to have them design MIDI interfaces that use alternative means of interaction - like facial recognition, for example. Another project that we are starting this semester is in collaboration with an important museum in New York that will use digital fabrication and local materials such as Cochineal dye. I hope to use Max for these type of projects again!